JC’s Landscaping provides a variety of landscaping services as a total solution to lawn care for North Texas. Our sod installation is guaranteed to be weed and pest free. At JC’s Landscaping, a well-established licensed and insured DFW lawn care company, we are dedicated to providing you with the very best value in high quality sod installation. You can count on a high quality product and service at a reasonable price when you purchase a sod installation plan from us. Our sod installation team has over 15 years experience, and we work with only the highest quality of sod provider in the DFW area. We use this high quality, dependable sod provider because they offer the widest variety of types of grass (several different types of Bermuda, St. Augustine and Zoysia) and we never have any problem with weed or pest infestation when using this premium sod. 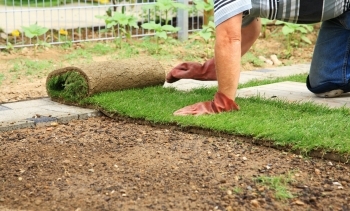 Our sod installation process is professional and effective. A sod installation expert from JC’s Landscaping will examine and evaluate the property to determine the sun/shade mix that your lawn currently gets. We will review your options and suggest the best sod type(s) for you to have installed. Once you have made a decision on the type of sod you would like, we will provide a detailed estimate of what it will cost to have the sod delivered and installed. We will then set a time and date for the job to be completed. Install the new sod in a staggering joint fashion to ensure you do not encounter any water runoff with the new sod.